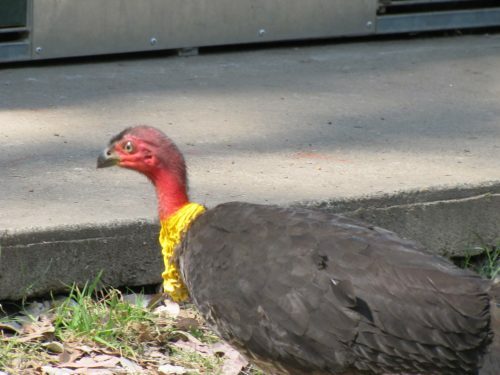 Brushturkeys are not everyone’s favourite bird. In fact, many people regard them as pests. This is especially so when the turkeys scratch around in their gardens. I believe that they can make quite a mess of a garden when they are making a nest mound to incubate their eggs. On our recent trip to Sydney to stay with family, my wife and I had several occasions where we spent time in the nearby Lane Cove National Park. It is a lovely park with plenty of picnic areas for visitors. As a bonus, the park is only a ten-minute drive from where we were staying. On one visit to the national park, we were relaxing near the river. We had enjoyed a hectic few weeks with our grandchildren – ages 9 and 6 – and we were just looking for a quiet time of relaxation. 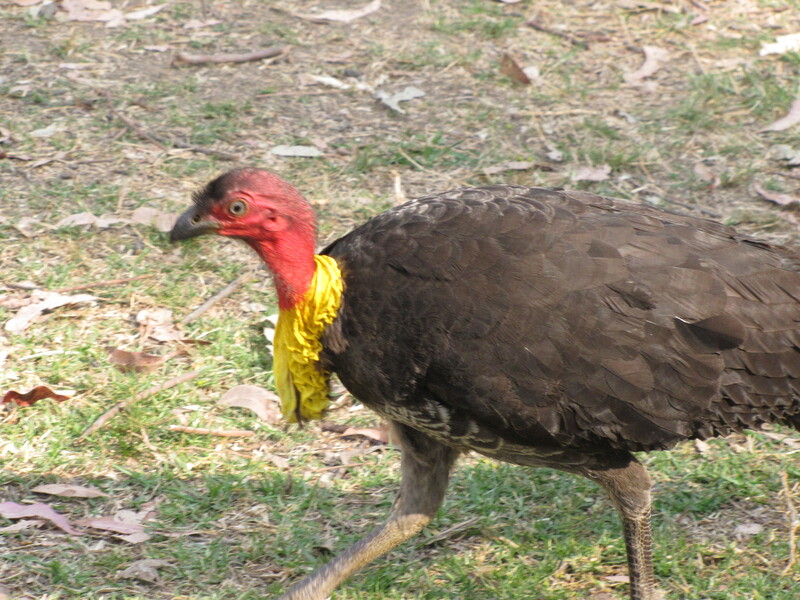 One of the resident Brushturkeys, however, saw us as easy pickings. It wandered around our chairs looking for a handout or two. 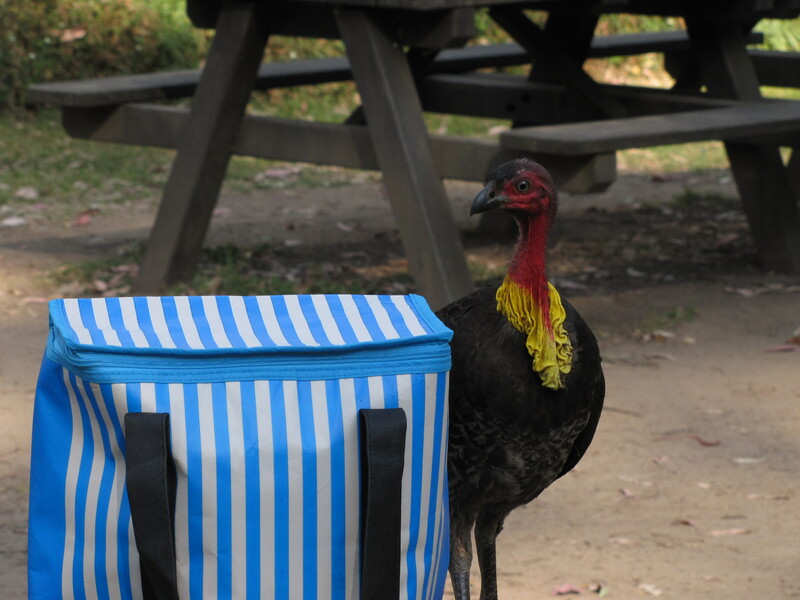 When this wasn’t forthcoming, it jumped on the picnic table and began to scrounge around our things on the table (see photo below). 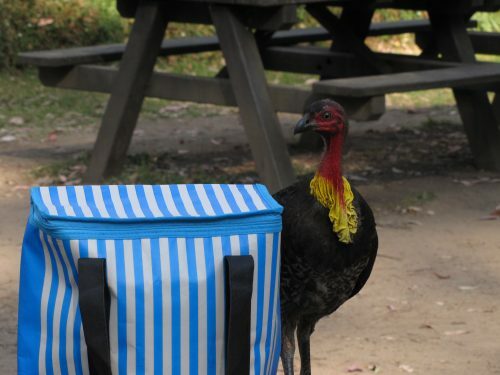 It actually tried to unzip our cooler bag. It was obvious that it had done this before and knew exactly what to do. It was unsuccessful because I chased it off. A few minutes later, it returned, this time attempting to open our biscuit tin. This was a beautifully decorated tin my wife had bought recently at the fair run by the school our grandchildren attend. It began scratching at the lid of the tin, attempting to open it. I again chased it off before it could scratch the tin. It was also in danger of moving the tin off the table and the lid may have opened on impacting the ground. The birds have character and attitude. In heaps – and sometimes this character spills over into being annoying. They are easy to photograph – they come up close to humans and are generally unafraid.